Learning Forward Kansas is an organization that focuses on improving educator effectiveness and learning for ALL students in the state of Kansas. 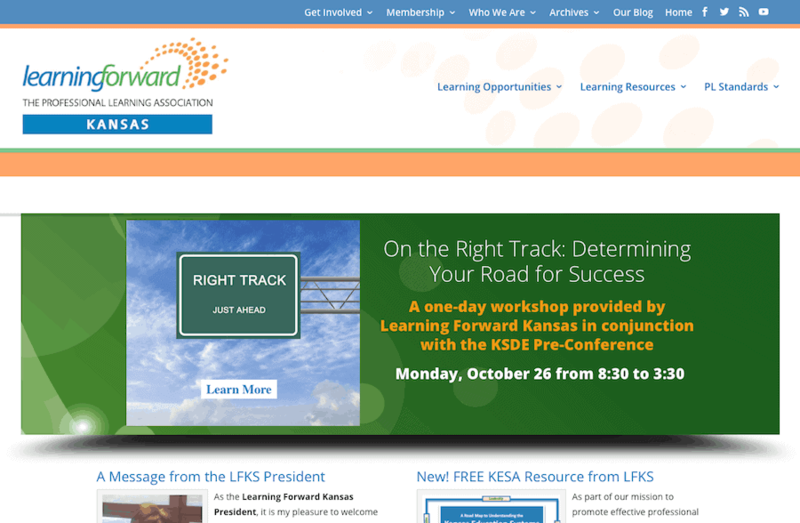 An affiliate of the national Learning Forward organization, Learning Forward Kansas (LFKS) provides professional learning opportunities and support for Kansas educators. In the past their website was created and modified with pure code, but the leaders of LFKS felt the need to be able to update the pages themselves. As a result, we decided to move their web pages into WordPress. As the leaders made plans for the new website, they brainstormed and created lists of their wishes and dreams, including an interactive map of Kansas with sunflower pins for board members’ locations, interactive and engaging home page features, and online conference and event registrations and payments. The new Learning Forward Kansas website meets all the needs of the organization, and it is colorful and engaging enough to call its online visitors to action — to join the organization and to get involved with the many learning opportunities provided.